Burgers, Henri J.; Van Den Bosch, Frans A.J. ; Volberda, Henk W.: Why New Business Development Projects Fail – Coping with the Differences of Technological versus Market Knowledge; in: Long Range Planning, Vol 41 (2008), No. 1, pp. 55-73. Especially point No. 1 is noteworthy for it’s interesting framework and the transfer of their framework onto other projects, e.g., IT. Burger et al.’s framwork spans two dimensions: market knowledge (existing vs. new) and technology knowledge (existing vs. new). 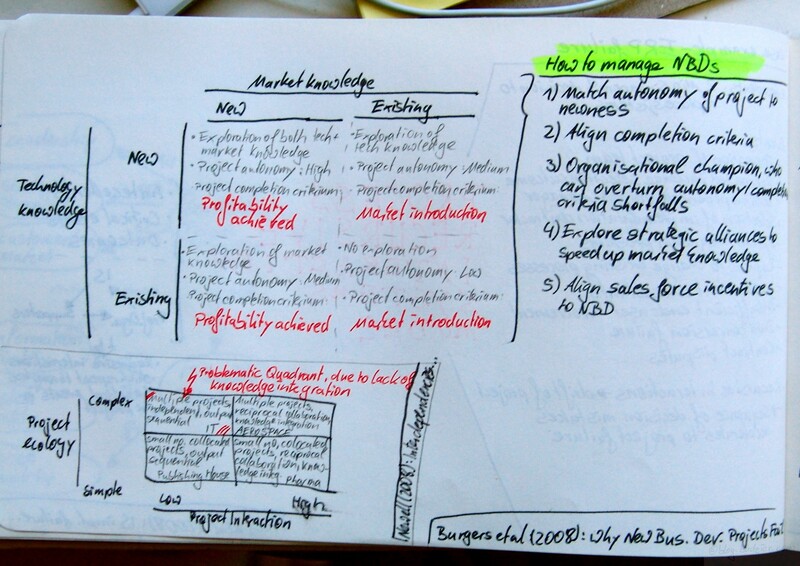 If both knowledge areas are new fields to the organisation (technology and market), the project needs maximum autonomy, it’s goal should be the exploration and the product should stay in project mode until it achieved profitability. Whereas a project were both areas of knowldge pre-exist, the project should not explore, needs little autonomy and the product should be handed over into operations as soon as it hits the shelves. Newell, Sue; Goussevskaia, Anna; Swan, Jacky; Bresnen, Mike; Obembe, Ademola: Interdependencies in Complex Project Ecologies – The Case of Biomedical Innovation; in: Long Range Planning, Vol. 41 (2008), No. 1, pp. 33-54. The second article in this post examines innovation projects from a different angle. Newell et al. draw a typology of projects based on their ecology and integration. They state that challenges associated with managing projects that are distributed across time, space and organizations  a common, though under-researched, feature of innovation in numerous high-technology domains. Like marriage counselors they argue that in a complex project environment (high degree of interdependencies) a high level of interactivity is most fruitful. The reality check, as it turns out in the analysis, shows however that most project run as black-boxes, no knowledge is transferred between projects, and the level of collaboration is low at least. A case example for a bad marriage. Finally Newell et al. explore the reasons for this, and pay particular attention to the effects of power dynamics and the sector’s dominant knowledge regime. This entry was posted on Donnerstag, September 18th, 2008 at 09:12 and is filed under Failed Projects. You can follow any responses to this entry through the RSS 2.0 feed. You can leave a response, or trackback from your own site.